We lived in the village and we were, like many others, fascinated by the quirky house with the tower. Very few people had entered the house after the closing of the station in the late -60’s until the local land owner association bought the house after years of being State property. There were many ideas on what to do with the building, and all had to do with opening up the house and making it accessible. For example, as a bed and breakfast. We didn’t think we would be the ones to do it until a year or so later, when it all of the sudden was the most natural thing for us to do. We would bring the house back to life. We started by renovating the house. We only intended a facelift, but ended up doing a little bit more. The house deserved it, and it inspired us. At the same time, we couldn’t help but wonder if we actually were up for the task. We had planned to open by Midsummer 2014 after only a three-month renovation and it was a battle against the clock. We worried as we had no bookings for the summer by the time we had our Grand Opening, but there was some buzz. Eventually the guests started to find their way to us, perhaps with some thanks to the hottest summer ever. We are very happy to have had the opportunity to make this journey, we learn every day in pursue of our goal to put this tiny village on the map as a destination worth while in all it’s simplicity. A place to just be. Simple, inspiring and personal. Today, but inspired by the past. The Pilot Station in Järnäs is probably the county of Västerbottens’s first, established in 1725. The first official station building was built in 1833. The current house was built on the island of Storbådan in 1861 and moved it’s current location in 1904. The station was closed in 1967 and was property of the state until 2012 when the village association bought the house. 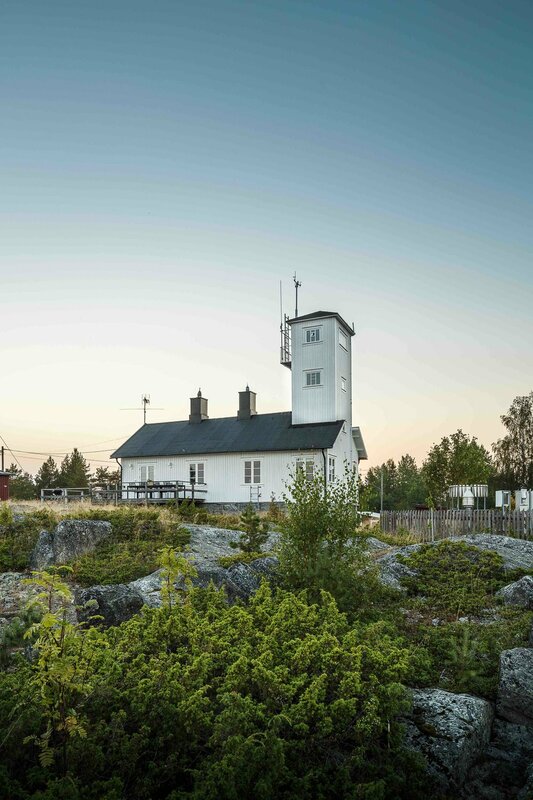 The house serves as a holiday home since 2014, allowing visitors to discover the coast of Västerbotten.